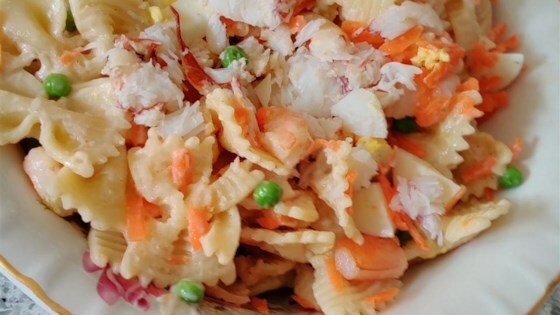 "A cool seafood salad for those hot summer days. It's a real treat for potlucks. Use your favorite pasta. Chopped celery or Vidalia onion may be added if desired." You may use fresh, frozen, or imitation crab meat. My mom used to make a macaroni salad very similar to this. I've beed looking for a recipe like it. I made it exaclty to the recipe & it was very good! Thanks! Have made it a few times because it was a big hit with the hubby. One thing I changed was amount of crab-I doubled it and used imi crab. Very good! Everyone liked it.